It’s no secret I’m a HUGE fan of smoothies for breakfast. Such a fan, in fact, that no other breakfasts really work for me. I love smoothies because they’re easy to make, easy to digest, and easy to load up with nutritious ingredients. Smoothies can also be whipped up in mere minutes, and they can be made in batches and refrigerated (or even stashed in the freezer!) to enjoy later. Major bonus points. All smoothies, however, are not created equal. Just like fresh juices, smoothies can often be low in nutrients and high in sugar — especially when purchased pre-bottled or even at a juice bar. That’s why many people find smoothies unsatisfying enough to stave off hunger pangs until lunchtime. Add Fiber: You need fiber for a lot of reasons. Dietary fiber removes toxins from the body, stabilizes blood sugar levels, supports healthy bowels, and helps reduce cholesterol. Fiber also helps you maintain a healthy weight by keeping you fuller for a longer period of time. Easy ways to incorporate more fiber include adding fresh greens, whole fruit (vs. juice) — even oatmeal (see recipe below!). Remember Healthy Fats: Not all fat is bad! Healthy fats such as monounsaturated fats (found in avocados, nuts, seeds, olive oil, etc.) and polyunsaturated fats (such as omega-3 fatty acids found in flaxseed and walnuts) are important for supporting healthy blood sugar levels, cholesterol levels, blood pressure, and skin — as well as helping reduce overall inflammation. Adding a small amount of healthy fats to your smoothie can balance the natural sugars from the fruit (if using) and keep blood sugar spikes at bay. The healthy fat will also support a slower digestion process, which helps with hunger. You don’t need to add a lot — a tablespoon of nut butter or a quarter of an avocado should do the trick. Maximize Nutrients: The standard American diet is notoriously low in nutrients, which helps explain why so many people feel hungry in spite of their cheeseburger-and-fries lunches and supersized mocha-lattes. Why? 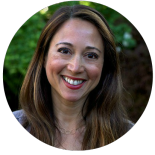 It’s simple: our bodies intuitively seek balance, and if we eat nutrient-poor foods, our bodies crave more food (even more “bad” food) in an effort to secure more nutrients. However, if we eat nutrient-dense foods — vegetables, fruits, legumes, lean protein, whole grains — our bodies are more satisfied, and our cravings diminish. Same with our smoothies. If your smoothie includes nutrient-dense ingredients such as greens, fresh fruit, healthy fats and fiber, your body will feel more satisfied for longer. 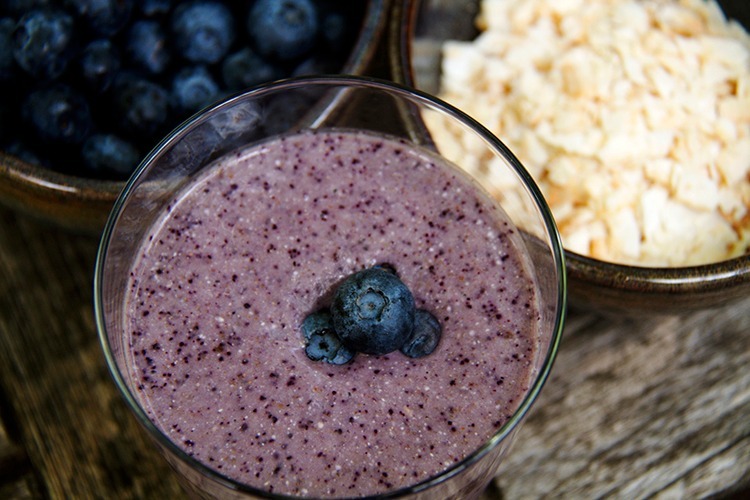 Some things are better explained through a recipe — so let’s talk about my Blueberry Oatmeal Smoothie. This smoothie is a a great alternative for when you’re burned out on green smoothies — and it’ll still taste great if you want to add spinach. The blueberries, rolled oats and chia seeds all provide fiber, while the coconut flakes and avocado provide healthy fats and creaminess. 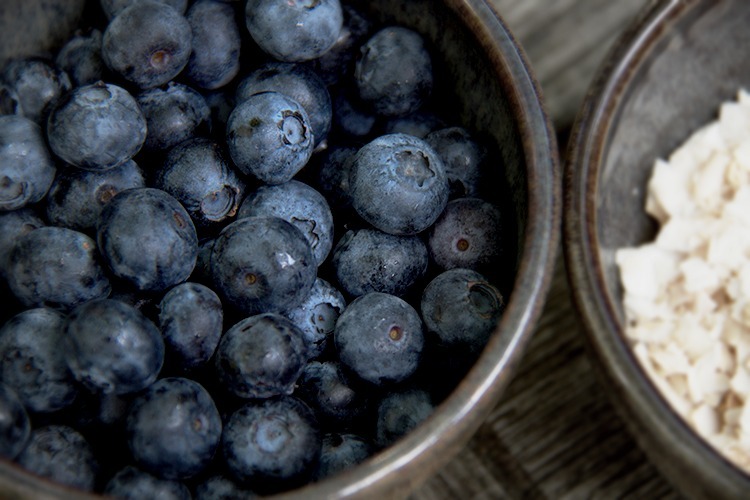 As for nutrients, we’re also covered there — blueberries rank among the most nutritious of fruits due to their high antioxidant and phytonutrient content. To finish, I also add a generous amount of cinnamon (helps stabilize blood sugar levels) and a tiny drizzle of maple syrup to give this smoothie that “oatmeal” essence. This also makes the smoothie extremely kid-friendly. This smoothie is especially great if you live in an area where’s it’s currently blueberry season. It’s raining blueberries here in Oregon — I love it! Great post! Do you have an estimate on the nutritional breakdown for the smoothie? Thanks for sharing all of your amazing info! Sugar is something I definitely watch, though. That’s why I don’t typically drink fruit or fruit-based juices — the absence of fiber can cause sugar spikes and lead to crashes and cravings. I mostly rely on whole fruit (or a date or two) for sweetness. I really appreciate this one – we added the coconut yesterday and I’m planning to use the oatmeal soon. No need to cook the oatmeal? Just throw it right in? Thanks, Monica. I will. And I’m a convert to the smoothie freezing too. I thought the texture would be odd, but I took a frozen smoothie on a long drive to a conference and it was delicious three hours in. I’m thinking this might work for school lunches too if I could find the right (non-glass) container. Thanks again! I love that you took your smoothie on a road trip — what a great idea! Too bad they’re not TSA-approved. That would a great alternative to in-flight snack boxes! Do you think steel cut oats would work as well? I’ve been doing green smoothies and loving them, but I’m getting a little bored and think I need to try something different. In happened to pick up half a flat of blueberries to use and freeze, so this would be perfect! Great question — I don’t know. I’ll have to try it out! Depending on your blender, you might soak the oats overnight first, then discard the soak water. Happy (blueberry) blending!